One eco-friendly option when searching for sustainable wood products is the use of reclaimed wood. Reclaimed lumber involves the use of wood products previously used in the construction of old structures that are commonly disposed of during the demolition phase. These products include salvaging of lumber from old homes, barns, industrial mills, railroad ties, fences, and furniture. Also logs from the early 20th century log trade can be reclaimed from the bottom of rivers that never made it to the mill. One of the most overlooked aspects of green building is obtaining material when possible from within 200 miles of the building site. In order to promote sustainability, make every effort to use Southeastern lumber products, instead of West coast or Canadian products. In terms of sustainability, reclaimed wood products are the best choice, due to the need not to harvest new wood products. These products can be hard to locate, but with enough searching, you can give perfectly good timber product a second chance at life. Basically it's just a matter of finding it and prepping it for reuse. Many enthusiasts claim the extra effort is worth the time necessary to obtain these products due to the richness of grain, unique character, color, and strength. Even though many reclaimed wood products may have penetrations from nails, metal stains, and other imperfections, these products are becoming increasingly popular due to the appeal they provide. 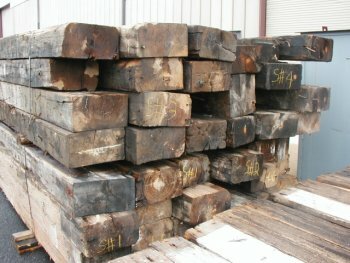 Old growth timbers are very popular due to strength, unique character, and massive size that is uncommon today because trees are not allowed to mature fully when grown in a controlled environment on a tree farm. Some of the most popular reclaimed wood products include old growth heart pine, oaks, Douglas fir, and redwood. For more information on sustainable wood products for your home, please call Mountain Construction Enterprises for an appointment.